Among the infected persons there are healthcare workers – at the Sofia ”Sveta Anna Hospital” are the most. Over 80% of the infected with measles in our country are non-immune children. Among the affected adults there are 14 unvaccinated hospital staff. The most affected are Sofia, Sofia-District and Blagoevgrad. Most cases of measles occur in Ukraine, Northern Macedonia, Italy and France. In Bulgaria, immunization against measles began in 1969. Those born before 1969 have not been immunized. All project documentation is published on the airport website and is accessible to the public in order to ensure transparency of the process, the International Finance Corporation (IFC) said. The International Finance Corporation (IFC), a member of the World Bank Group, and the European Bank for Reconstruction and Development (EBRD), assist the Ministry of Transport, Information Technology and Communications in conducting the concession tender at Sofia Airport with the implementation of the best world practices. “We are witnessing the imposition of Bulgaria as an attractive investment destination in the region,” said Fabrizio Zarcone, World Bank Permanent Representative for Bulgaria, the Czech Republic and Slovakia, quoted in the report. The investor, who proposed a combination of the highest annual installment and the best airport development concept, would win. The winner must also pay fixed initial payment of 281 million euros. She met with the Minister of European Integration of the Republic of Serbia Jadranka Joksimovic, reported NOVA TV. This was stated by the Deputy Prime Minister and Minister of Foreign Affairs Ekaterina Zaharieva during a plenary meeting with the Minister of European Integration of the Republic of Serbia, Jadranka Joksimovic. The European integration of the Western Balkan countries is a priority in Bulgarian foreign policy and was among the four priorities of the Bulgarian European Presidency. Last year, under the Bulgarian Presidency under the leadership of Ekaterina Zaharieva, Serbia’s Accession Conference opened two new chapters of EU membership talks. The two ministers also met today with a meeting of four eyes, which, in their words, has gone into a friendly atmosphere. They discussed transport and energy issues and projects that are important for bilateral relations. Ekaterina Zaharieva and Jadranka Joksimovic united around the view that in the relations between the two countries in recent years there is a new positive spirit, which has to be developed in the future. Traditionally good contacts between the two peoples, as well as the ever-increasing tourist flow, have been highlighted. They underlined the importance of joint projects in the field of energy and transport, highlighting the need for more intensive cooperation in education and science. Minister Jadranka Joksimovic stressed the benefits of the projects implemented with Bulgaria’s support for development aid and hoped that they would continue. By financing development projects, Bulgaria will support a total of 9 Western Balkan countries and the Eastern Partnership this year, including Serbia. The total value of all projects is almost BGN 3.5 million, with Serbia funding for projects in Bosilegrad, Dimitrovgrad, projects for the convergence of Serbian and European education, and others. The country also provides BGN 35 000 for the continuation of the project of the Center for Migration Studies in Serbia, which resulted in articles and news in Bulgarian for the first time in 2018 in a national Serbian daily. As of April 22, 2019, the Ministry of Health reported 463 cases of measles. There were eleven districts in the country: Sofia-District – 165 patients, Blagoevgrad – 136 patients, Sofia-city – 134 patients, Pazardzhik and Pernik – 6 patients, Burgas – 5 patients, Veliko Tarnovo and Kyustendil – 4 patients, Lovech , Montana and Plovdiv – 1 patient. In the last 16 weeks of 2019, most cases were reported from Sofia City – 30 cases, Sofia-District – 16 cases and Blagoevgrad – 12 cases. By age groups the cases are distributed as follows: 0 years – 81 cases . ; 1-4 years – 153 cases . ; 5-9 years – 110 cases . ; 10-14 years – 17 cases . ; 15-19 – 17cases ; 20-24 years – 15 cases . ; 25-29 years – 22 cases . ; 30-34 years – 7 cases . ; 35-39 years – 20 cases ; over 40 years – 21 cases. ,,In 2018 between Bulgaria and Vietnam, a total turnover of USD 88.8 million was achieved. The increase compared to 2017 is about 10%, but I think we have a higher potential to realize.” This was said by the Minister of Economy Emil Karanikolov during a meeting with the Vietnamese Ambassador HE. Mr. Mr Doan Tuan Linh, in which they discussed the deepening of trade and economic cooperation between the two countries. Minister Karanikolov and HE. Doan Tuan Linh agreed that the Free Trade Agreement between the European Union and Vietnam, which is expected to be signed at the end of June this year, will further encourage trade, economic and investment cooperation, and potential between Bulgaria and Vietnam. The Minister of Economy pointed out that during the Bulgarian Presidency of the EU our country actively supported the signing of the Agreement. He was firmly committed to a swifter ratification of the trade agreement by the Bulgarian Parliament in order to provide fast access for exporters and investors from the country and the EU to a rapidly growing market of 95 million consumers. “Vietnam is our traditional trade and economic partner, with whom we cooperate excellently, but we need to build on to develop the full potential and optimize bilateral trade,” Karanikolov said at the meeting. Ambassador Doan Tuan Linh said that Vietnam can be the gateway for goods from Bulgaria to the Pacific region and the countries of Asia and our country to provide opportunities for those from Vietnam to the EU markets. In order to identify and realize new opportunities in the commercial and economic sphere, they agreed on the 24th session of the Bulgarian-Vietnamese Mixed Commission in November 2019 in Sofia to be accompanied by a business forum. Bulgarian exports to Vietnam in 2018 amounted to $ 33.0 million. Imports from Vietnam for the same period amounted to US $ 55.8 million. Deputy Prime Minister and Minister of Foreign Affairs Ekaterina Zaharieva opened the first meeting of the National Committee on International Humanitarian Law, established earlier this year, the press center of the Ministry of Foreign Affairs announced. The Committee is established as an advisory body to the Council of Ministers, which will coordinate the efforts of the individual Bulgarian institutions and non-governmental organizations and will support the formation of national policies in the field. “There is no better time for such a 2019 initiative when the world marks 70 years since the adoption of the Geneva Conventions, but in the coming months, the International Red Cross and Red Crescent Movement will hold its 33rd international conference once convened four years”, said Ekaterina Zaharieva. She pointed out that 70 years after the adoption of the Geneva Conventions unfortunately the military conflicts around the world are increasing and more and more people are in need of international humanitarian aid. ,,I hope that this committee will not become yet another formal initiative, but with the decisions of its expert group to make a full review of the Bulgarian legislation and the legislation in the area and to make recommendations to the respective institutions”, Zaharieva noted. She urged members of the committee to use the moment and give voice to the Bulgarian example in the field of international humanitarian law, including the work of Bulgarian representatives in international organizations. Among the decisions taken at the first meeting was that Bulgaria would join the 2017 Political Declaration on the Protection of Medical Staff and Medical Assistance in Armed Conflict. The document was initiated by France. At that time, 39 states have expressed their support for the declaration, of which 21 EU Member States. National committees on international humanitarian law exist in 112 countries around the world and in 20 of the 28 EU Member States. They have the essential function of assisting Member States in the implementation of the 1949 Geneva Conventions and the Additional Protocols thereto. The Bulgarian National Committee includes representatives of the Ministry of Foreign Affairs, the Deputy Ministers of the competent ministries, the State Agency for Refugees at the Council of Ministers, the State Agency for Child Protection and the Bulgarian Red Cross. Have you heard of the Freakshake trend? Freakshakes refer to huge milkshakes loaded with ice-cream, cream and flavored sauces. But they also include unlikely ingredients. Think donuts, cake, biscuits, brownies and other sweet delights. Freakshakes have become huge in the food service industry. Small restaurateurs should consider capitalizing on the freakshake trend. Put this deliciously popular type of milkshake or dessert on your menu? Want to create a Freakshake for your small restaurant? Fill a large glass jug with a luxury milkshake. Make this with ice cream and chocolate, strawberry or another flavored sauce. Then pile up goodies that look as delicious, striking and ‘sinful’ as possible. These goodies include cake, donuts, waffles, marshmallows, fruit, chocolate and more. Then throw a handful of sweets on top for good measure. Want to know how far the freakshake phenomenon has gone. Well, some restaurants even offer savory freakshakes. And they include ingredients like cheese and pulled pork replacing donuts and waffles. This high calorific dessert supposedly originated in Australia in 2015. A café in Canberra seems the likely creator of the drink. Thanks to the sharing power of social media, these oversized, ultra-sweet milkshakes quickly became a global sensation, with cafes, restaurants and customers delighting in sharing their freakshakes to followers, and the more flamboyant, striking and gastronomically sinful, the better. These brightly-colored edible creations are made to be photographed and shared around the world on social media, with the photo-sharing portal Instagram being a favorite channel for restaurants and freakshake-happy customers to share their freakshake images. A mere search of #freakshake on Instagram brings up more than 50,000 posts, each trying to outdo each other on the flamboyant stakes. SMORELICIOUS vs COOKIE MONSTER ???? if you HAD to choose, which one would you go for?! ? Rather than being pictured toasting with a glass of bubbly or a pint of beer, social media users are posting pictures of themselves raising their freakshake glasses, accompanied with their location in the world and often the name of the establishment that has served them the delicious freakshake. It’s not uncommon for the biggest, boldest and most daring of freakshake posts to go viral. The trend to share images of outstanding freakshakes on social media presents a wealth of marketing opportunities for restauranteurs, cafes and ice-cream shops. Serving over-the-top freakshakes to your customers will encourage them to share the mouth-watering milkshake/dessert that lies before them on social media, meaning your creation is shared around the world and could event go viral. Research shows that around 126,000 Googles searches are made for ‘freakshake’, meaning if your website, online menu, social media profiles and other digital entities includes the word ‘freakshake’, your rankings on search engines like Google could significantly improve, helping you pull in more customers as a result of your freakshake marketing. As well as being a powerful marketing force for ice-cream businesses, cafes, restaurants and bars around the world, the great thing about freakshakes is they’re not difficult, too timely or expensive to make. All you need is plenty of ice-cream, cream, sweet sauce, sticky sweet treats, sugar, sweets and whatever other deliciously sinful treats tickle your fancy, thrown in with some creativity and daringness and you’ll have a masterful culinary creation your customers will love you for. 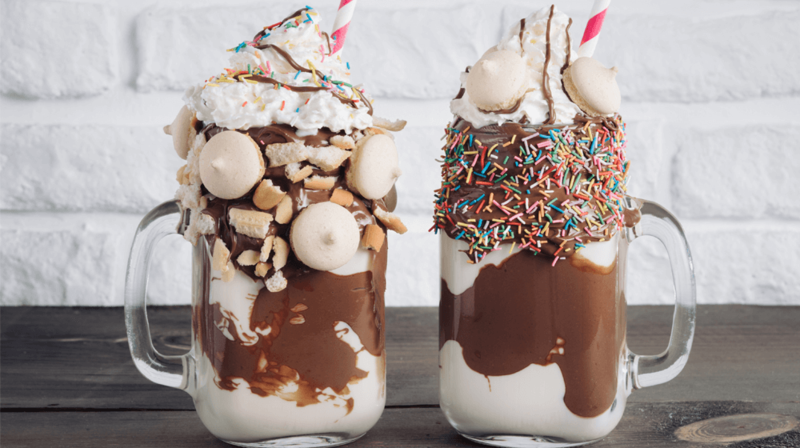 Given the popularity, trendiness and potent promotional potential of freakshakes, ask yourself – is a freakshake something your business can afford to ignore? “Bulgaria has a long history with Kuwait, which brings us an excellent bilateral relations.” This was stated by Deputy Prime Minister Mariana Nikolova during a meeting with a Kuwaiti parliamentary delegation headed by Mr. Rakan Yousef al-Nisf, chairman of Kuwait – Bulgaria Friendship Group, the press center of the cabinet said. Nikolova pointed out that Bulgaria enjoys high macroeconomic and financial stability and that the annual growth of nearly 4 per cent is among the highest in Europe. In turn, Rakan Yousef al-Nisf pointed out that the Kuwaiti investments in Bulgaria, which amount to about $ 2 million, are not enough and work needs to be done to increase them and there is a potential for that. ,,The government has an excellent dialogue with business and trade unions, in the field of energy”, Energy Minister Temenuzhka Petkova told journalists on leaving a meeting with Prime Minister Boyko Borissov with representatives of employers’ and trade union organizations in the Council of Ministers. The meeting with the Prime Minister today was organized at the request of the four employers’ organizations and the two unions. Temenuzhka Petkova informed that at this meeting representatives of the employers’ organizations have raised concerns about the rise in the price of electricity on the free market from the beginning of April. She has assured the business and trade union representatives that the state fulfilled its commitments to the energy exchange. The companies of the BEH Group, in compliance with the Energy Act, sell electricity on the free market. Apart from that, state energy companies offer daily more than 680 megawatts per hour on a “Day ahead” platform at a price of BGN 44.10. “This is a price that has been set by the European Commission and a commitment that we strictly adhere to,” assured the Minister Petkova. You are currently browsing the Business, finances, forex blog archives for April, 2019.